A thriving metal scene can really be the source that pushes new bands to come out of the woodwork touting a style that you would least expect. Enter stage left, Melbourne (Australia) quinttet Be'lakor, who are vocalist/guitarist George Kosmas, guitarist Shaun Sykes, keyboardist Steven Merry, bassist John Richardson and drummer Jimmy Vanden Broeck. Formed in 2004, this outfit earned their stripes in front of home town audiences in an effort to refine their dark art to what would become their debut self released effort titled The Frail Tide. Harmonized guitars offer an epic beginning to the opener Neither Shape Nor Shadow as it builds and soon lives up to that initial epic feel via it's almost full eight minutes. Haunting acoustic guitars balanced to perfection with the moving strains of Merry's keyboard work continue the twisting and turning journey that darts in and out of melo-death metal and blackened thrash provide a mix that blurs the lines somewhere between Opeth and the likes of Agalloch. It's an interesting mix but I'll be damned if it isn't an engaging one! In the heaviness department, riff wise things thicken up with The Desolation Of Ares which has a very Swallow The Sun like vibe to it, not only because of the guitars themselves, but also due to its trudging tempo and Kosmas' deep vocals. The acoustic interlude just past the midway point provides the back bone for the build up to its grand finale - pure aural bliss! Fans of Amorphis will salivate over the excellent Tre'aste, although the thrashing pace at around the two minute mark might surprise some. That's the thing about what Be'lakor has captured here. 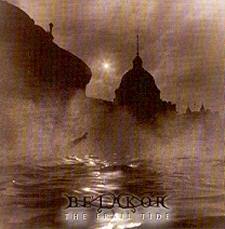 Sure, this album is only six songs and it clocks in at around 43 minute or thereabouts, but at no time do the songs become monotonous or uninteresting, and therein lies one of the Be'lakor's strengths! In the diversity stakes though, The Natural Apostasy is way up there, moving from a heavy outset to the folk sounding finale, complete with flute courtesy of Megan Sykes, whilst the strings/piano lead Paths slows things down over the next six or so minutes, before Sanguinary blasts the album back to life with a fiery finish. The Australian metal scene continues to churn out top shelf acts, and Be'lakor are making a firm statement of intent with The Frail Tide. They are off to a flying start with these six songs as they show a great deal of promise, and I for one look forward to hearing more from them in the future.